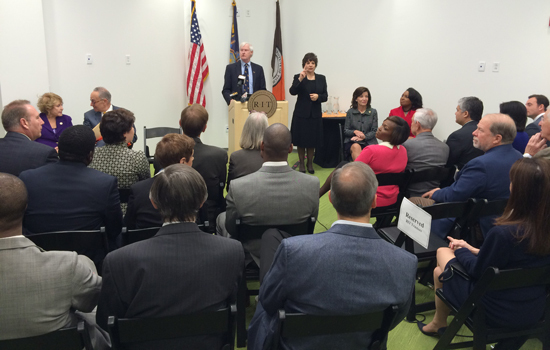 RIT President Bill Destler spoke at the grand opening of RIT’s Center for Urban Entrepreneurship today in downtown Rochester. The center, known as CUE, is located in the heart of the city’s downtown innovation zone and is working to help reshape the regional economy and build wealth within the urban community by being the hub for urban entrepreneurial programs and research. The Center for Urban Entrepreneurship, a program of Rochester Institute of Technology, was celebrated today at a grand opening ceremony of its new office in a historic downtown building. Among the more than 100 invited guests were clients of the center, as well as community leaders and federal, state and local elected officials, including U.S. Sen. Charles Schumer, Rep. Louise Slaughter, Lt. Gov. Kathy Hochul, Monroe County Executive Cheryl Dinolfo and Rochester Mayor Lovely Warren and representatives of the U.S. Economic Development Administration. Those attending the ceremony were also invited to tour the 5,000-square-foot facility. CUE, which began offering programming in 2014, now has a permanent place on the first floor of RIT’s Downtown Center for Innovation and Entrepreneurship, the historic building at 40 Franklin St. that was once home to Rochester Savings Bank. The building, constructed in 1927 and now on the U.S. National Register of Historic Places, was donated to RIT in 2012 by Rochester Historic Ventures, which is comprised of members of the Leenhouts, Tait and Tones families, along with members of the Broadstone Real Estate management team. Rochester Historic Ventures took ownership of the building in 2011. Since taking ownership of the building, RIT has made significant renovations throughout the building with grants provided by the U.S. Economic Development Administration and New York state, as well as university funds. RIT estimated $2 million was spent on renovations just to the CUE offices, with 58 percent of the expenditures going to women or minority-owned contractors and suppliers. The renovations were done to accommodate the needs of CUE’s various programs, which include Future Business Leaders and Entrepreneurs, Capacity Building, Lemonade Day and a variety of targeted workshops. CUE’s offices also include meeting rooms for clients, shared workspace and a multipurpose classroom. The space has wireless technology throughout. Prior to moving into 40 Franklin, CUE had been operating out of a variety of spaces, including RIT’s Henrietta campus. Since 2014, CUE has served nearly 400 young people and adults in its various programs. “I am pleased to join President Destler, CUE Interim Director Ebony Miller, my colleagues in public service and those who are here for the celebratory opening of the Center for Urban Entrepreneurship. How fitting that we are in the former Rochester Savings Bank building, an institution dedicated to civic involvement, building a strong community and was described by Paul Malo as ‘few cathedrals of the New World evidence the grandeur of this 1928 temple of commerce.’ Sharing with its past, I know CUE will have a huge impact on our region and its economy. CUE will show new generations of entrepreneurs that with hard work, a little ingenuity, exemplary education and a strong foundation they too can build a bright future in our community. After all, I understand George Eastman started work at RSB as a bookkeeper, and while working here he got more interested and involved in the process of photography and left to form Eastman Kodak Co. This building and the Center for Urban Entrepreneurship have many more gifts to bestow upon our city and its families."